← What Has Kickstarter Ever Done For Us? This is a heads up for what I’m currently writing. If you’re interested in DZ you might want to subscribe (over there, on the right) so you get an email when the new post goes up. Firstly, I’m almost done with the Alpha. It’s ended up as a little scenario you can play, and it’s been a blast developing it. When I say a blast, what I mean is that I keep adding explosives into it, and I have to say that I’m especially pleased with the cinematic way they now work. High point of yesterday’s games was the mad antics of an Enforcer Assault trooper. There he goes, charging into a Stage 3 – he injures him, but before he can give the killing blow they’re joined by the Stage 3’s mate. Feeling a little outnumbered and without support, the Assault trooper dodges out of combat, picks up a grenade that had been dropped earlier and lobs in straight back into the fight he’s just escaped from. The resulting explosion kills the injured foe, injures the second and blasts him out of cover and into the open where he is promptly shot by the Enforcer’s mate from a distant rooftop. The Assault trooper himself is entirely too close to the explosion and is blasted backwards, but is saved by his robust armour. A couple of turns later the Assault trooper is making his way back to the Enforcer position when he picks up another item only to find that it’s been booby trapped. Again this blasts him into the next square, and again his armour saves him. Secondly, I’m going to start posting up a series of design theory articles for Deadzone, here on Quirkworthy. The Kickstarter should have some game play videos up soon, and these are quite broad, especially the first one. I anticipate more of the lack of understanding I’m already finding because I’ve done some odd, or possibly unique things with the rules, and without you being told you’ve got no reference for them. It would perhaps be easier if I could just mind-meld with you all, but there would be side-effects. The articles are both a chance for me to explain the thinking behind the rules and your chance to ask questions. It’s my way of trying to get everyone on the same page. By doing a series rather than just one I can hopefully keep a bit of a theme in each post’s comments so that we can all find things a bit more easily. The first one will go up tomorrow. All of these will be linked from the main Deadzone page in the top bar, so if you want to bookmark a link that’s probably the easiest option. “Mind-meld with Jake” should be a KS reward at $10,000.00. This is shaping up to be something great, and the outline from just this sounds interesting. +1 for making the rules available before shipping. You are the reason I’m backing this game Jake. The quality of your Dreadball rules and how you backup FAQ answers with your thoughts behind them make it a pleasure to play your stuff. I’m thinking of using my Sedition Wars figures as an additional faction instead of bothering to wait on the 1.5 fix to the flawed/frustrating/broken shipped rules in that game. Have to go town tomorrow, only two D8 left after the Klingon dinner, how many, and/or colour do I need? Each player needs about 6-8 normally, perhaps 10 to be safe. A roll of an 8 gets a new dice to roll so you need a couple spare. Colours are a matter of taste. You don’t need to differentiate between dice within your roll (at least you don’t so far). Plague could have manky, plagued dice, Enforcers could have nice, tidy, regimented dice that do what they’re told, etc. Glad to hear there are grenades in the game, it’s always fun to chuck a grenade at someone! As an aside I would also ask/beg of you to consider including smoke grenades and mines as specialist equipment (perhaps for an engineer)- I think the 3×3 grid system gives you the opportuinity to give lots of tactical options for hampering enemy movement and it allows for the planting of traps being an effective in-game mechanic which I have always found not to be the case in other games where movement is less regimented and the playing field is 4-6x larger. Already working on several types of grenade including smoke. Mines are a little trickier as the other player can obviously see what you’re doing. I think I have a nice way to do it though. The other issue is not wanting to bog down the game. We’ll see how it goes when I get the rules on the table. Note that the Alpha currently doesn’t have smoke. Already plenty for you to be learning. What about the “dummy” mechanism you used in DKH ie multiple tokens so the non-mine-placer doesn’t know where the live one is (unless a position is so tactically obvious…)? After the escapades of that Enforcer yesterday I find myself thinking of it as a movie. Even more than usual. I’m just too square to know what the currently overused cliche is. Mind you, I always try to avoid “easy to learn, hard to master”, even if it’s true. On the one hand this is an extra thing to deal with and I know you like streamlined efficiency in your designs, on the other hand this could be an interesting and (as far as I know) unique mechanic for Skirmish games. It could also be used for other things, such as hidden objectives, secret tunnels, or a variety of different mission ideas. Could also be an interesting alternative use for the ‘booby trap’ card, having specific tiles pre-trapped. I was hoping you would be doing something like this for Deadzone, I have kept my mind away from mechanical thoughts so far, simply because in so far we have nothing to base any core concepts for how the games mechanics will work upon, and though I love a good theoretical gaming mechanics debate/discussion and such at this time would be little more than wild speculation and wish listing based on guess work. Yet by doing a series of design theory articles you will both answer those core questions and actually give us the ‘go ahead’ for the Mechanical theory discussions to begin! I will say I hope that such discussions remain tempered by appropriate responses, that suffer neither from Trolling or the unwarranted attack upon those with a differing point of view to the larger community, as long as that point of view is put in a constructive (essential if critical) open minded and non aggressive way, as at the end of the day all opinions are subjective but by being opinions they are simply another point of view and not a Fact which can be right or wrong, this becomes especially relevant when discussing what becomes opinionated fact but once more I digress. Looks great – Bring forth the debates! 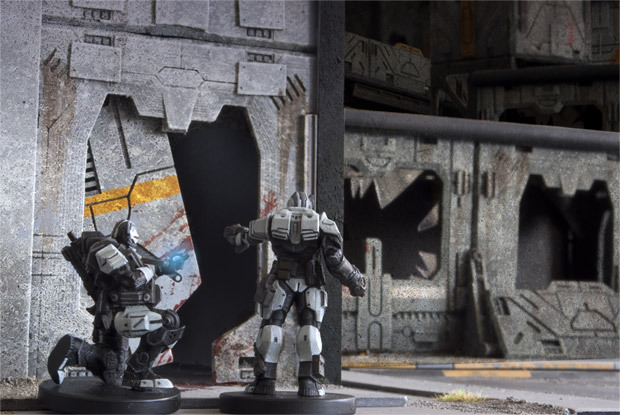 Hopefully your deadzone theory articles will give a place (along with the mantic forums – though this is a limited/constrained audience) for these ideas to gather, and inspire. Love the idea of someone teaching me design, makes some change, I have taught engineering design for far too long. The biggest difficulity is to remove pre-concieved notions and closed minds, esp. from those who should know better(just put it in as another constraint). I would love to follow your debate, and to stick my nose in as frequently as possible, I promise not to grade your work, but Chris will. I cant wait to see these. DreadBall has me running tournaments for the first time for nearly a decade. The grid based system for DreadBall has me considering all sorts of similar things… depending on the rules. Sorry to keep bugging you but I did have a question regarding the faction decks. Are these decks essentially stat cards for the different characters in the faction or are they a set of special actions that can be carried out by the faction player? I’ll get to the faction decks in more detail later. They’re far more than just stat cards though, and include special actions, missions and so on. Enforcer armour is very good (they are exceptional warriors) and the grenade wasn’t especially powerful. They are supposed to survive this sort of damage! Lucky? Perhaps. Mostly just well-armoured.